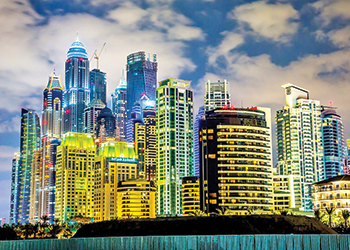 Dubai’s real estate market is gaining momentum. The value of real estate transactions in Dubai, UAE, reached Dh77 billion ($21 billion) through 20,000 deals during the first quarter of 2017, said Sultan Butti bin Mejren, director general of Dubai Land Department. Bin Mejren explained that according to the Land Department’s data analysis, there is an increase in the value of transactions by 45 per cent compared to the first quarter of 2016. This indicates that the real estate market in Dubai is preparing for a new phase of momentum and the rise and strong results achieved during the first quarter was not surprising but expected, especially with the sustainable growth that the real estate market is currently witnessing. He added that the total value of real estate investments reached more than Dh40 billion ($10.8 billion) through 15,501 investment transactions. Bin Mejren was speaking at a media gathering as part of the ‘Ask the Leader’ initiative organised by the Dubai International Government Achievements Exhibition 2017. Aldar Properties has awarded the main contract worth Dh500 million ($136 million) to Ghantoot General Construction, for development of its luxury golf and waterfront apartment project, Mayan, located on Yas Island in Abu Dhabi, UAE. As per the deal, Ghantoot General Construction will deliver the construction of five 11-storey buildings comprising 512 units. Nineteen of these units will be luxury beach villas overlooking the beautiful Yas shoreline, says the leading Abu Dhabi-based property developer. Situated on Yas Island, Mayan offers studios, one-, two-, three- and four-bedroom apartments, as well as a select number of golf course homes and beach-front villas. In addition to serene views of Yas Island’s blue waters and natural mangroves, and the lush green fairways of Yas Links golf course, Mayan residents will benefit from the community’s multiple swimming pools, children play areas, gymnasiums and retail outlets. The upcoming development is also minutes away from Yas Island’s renowned leisure and entertainment destinations, including Yas Mall, Yas Marina, Yas Marina Circuit, Ferrari World Abu Dhabi, and Yas Waterworld, as well as the dining and entertainment options at Yas Plaza hotels. UAE developer Meraas has announced the launch of four new hotel brands – Evado, Re Vera, Vivus, and MQ – as part of its objective to establish the company as a world-class hotel operator. The hotels aim to widen the hospitality offering in Dubai and present guests visiting the emirate, for business or leisure, a plethora of novel experiences. Meraas established its hotel operating arm in December 2015 to complement Dubai’s strategic roadmap of becoming a global destination of choice. The newly launched hotel brands are characterised by a set of distinct brand attributes, with amenities and services carefully curated to cater to the specific needs of travellers and visitors to the city, be it individuals or families with children. The first of the new hotels to be operated by Meraas are Re Vera and Vivus branded resorts located at Bluewaters. The hotels are on schedule to open their doors in 2018, and will be a short walk from Ain Dubai, the world’s tallest and largest observation wheel, being built on the island. Re Vera Bluewaters Resort boasts 178 luxurious rooms and 96 serviced apartments, ranging from one to four bedrooms that offer guests a secluded haven. Vivus Bluewaters Resort comprises 301 rooms and 119 serviced apartments also ranging from one to four bedrooms. Both resorts will offer an array of amenities and services. Additionally, guests will have direct access to a 450-m private beach. Prior to their launch, Meraas engaged a range of leading global consultants to ensure the amenities and services provided by all four hotels are in keeping with the needs and expectations of all guests. Damac Properties has launched Golfotel, the only premium five-tower hotel property surrounded by a golf course in Dubai, UAE. It will feature over 2,000 well-appointed contemporary rooms with golf views of the Trump World Golf Club Dubai, which is set within the 55-million-sq-ft community Akoya Oxygen. The hotel features amenities such as a lounge and international restaurants, a gymnasium, an outdoor swimming pool as well as shuttle services to the best tourist attractions all over Dubai and complimentary airport transfer. Meanwhile, Damac Properties has announced that it will open two ultra-luxurious hotels in Dubai within the next two months. Opening in May, the plush 250-key Damac Maison Bay’s Edge – strategically located in Business Bay – is a gateway to “the ultimate luxury”, service and opulent experience, with views over the Dubai skyline and Downtown Dubai. Spread across 22 floors, this hotel offers refined living in spacious deluxe rooms, and one, two and three-bedroom suites with exceptional services and privacy. Set to open in June, the new 305-key five-star Damac Maison Royale The Distinction – to be operated by Damac’s premium hotel operator Damac Maison Royale – will provide luxury hospitality and accommodation in Dubai’s Downtown district and boast stunning views from each of fully serviced deluxe rooms as well as one-, two- and three-bedroom suites of its 52 floors. Dragon City hotel ... ground broken. 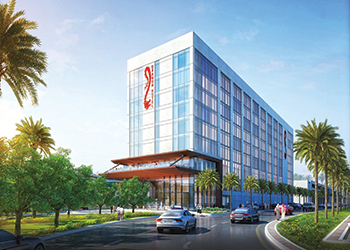 Leading real estate developer Nakheel’s second hotel at Dragon City in Dubai moved a step closer with the award of a Dh136-million ($37 million) construction contract to Al Ghurair Contracting and Engineering Works. With a total project value of Dh176 million ($48 million), the 304-room Premier Inn is one of 16 hotels in Nakheel’s Dh3-billion ($816 million) hospitality portfolio and part of a huge new masterplan that is transforming Dragon City into a giant retail, residential and recreational complex of more than 11 million sq ft.
Set for delivery in 2019, Premier Inn Dragon City will have a restaurant, Costa coffee shop and gym. The hotel will offer a built-up area of 178,000 sq ft, over eight floors. It is one of two Nakheel hotels managed by the UK’s Premier Inn. The first, a 372-room hotel at Ibn Battuta Mall, opened last October. Nakheel’s expanding Dragon City mixed-use community comprises four million sq ft of retail space, a twin-tower residential complex with 1,120 apartments and two hotels with 516 rooms between them. It is currently best known for Dragon Mart – the world’s largest Chinese trading hub outside China – featuring the globally-renowned Dragon Mart 1 and its sister mall, Dragon Mart 2, which opened in February last year. The two malls welcome 40 million visitors a year. Dragon City’s retail expansion includes a 375,000-sq-ft showroom complex, currently under construction. Nakheel’s expansion into the hospitality industry is bringing over 5,300 rooms between them, to Dubai. Two are open and operational and in March the company awarded a construction contract for a second hotel at Ibn Battuta Mall. Others are at various stages of construction and development. Trading powerhouse Al Khalili Group said it has signed an agreement with real estate investment expert Tibiaan Properties for collaboration on a unique $100-million project portfolio with high-end residential, commercial and retail components in Oman. The first phase of the partnership between Al Khalili and Tibiaan will comprise 67 exclusive villas with private pools set in strategic locations of the capital Muscat starting with a unique development on the Al Athaiba beachfront. This will be followed by a series of sophisticated retail, leisure and lifestyle assets including a boutique shopping mall offering a refined range of retail experiences, remarks group chairman Sheikh Qais Al Khalili. “We are inspired by the tremendous possibilities of this collaboration, our first build-to-sell venture. The magnitude of the multi-faceted portfolio we have created with Tibiaan, real estate specialists of the highest standing, is a sign of our confidence in the real estate market’s potential, its strong prospects for growth, and of course Oman’s immense appeal as an investment destination,” states Al Khalili. The Al Athaiba beach villas projects of the first phase of the massive development undertaking will be available for off-plan purchase later this year, says the Al Khalili Group.